I’ve been thinking even more about leadership than I usually do. And I’ve always done it a lot given the fact that I started out as a political scientist. It’s been on the top of mind since the 2016 election, but it has become even more important to me in the last weeks for four new reasons. 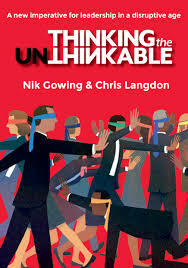 First, I read Nik Gowing and Chris Langdon’s new book, Think the Unthinkable, whose red cover depicting blindfolded leaders seemingly aimlessly wandering around. Second, my friend Fred Krawchuk has spurred to think about the related field of design thinking. Third, AfP’s CEO, Melanie Greenberg, took a new job and we have to think about the kind of leader we would like to replace her. Finally, my colleagues at AfP did an intriguing report on using adaptive management in concrete peacebuilding programs which touched upon leadership issues especially as raised by thought leaders like Ron Heifetz and Lant Pritchett. After decades of reading about leadership, occasionally practicing it (not always all that well) myself, and taking these recent nudges into account, I ended up focusing on four leadership traits. None will be all that surprising to people who have read the literature on organizational behavior over the last thirty years. All, however, are practices that are in short supply these days because our leaders have not done all that good a job of fostering organizational cultures based on them. All apply, too, to the challenges of the last few weeks and months that got me thinking about leadership again. Last but by no means least, each takes me away from both of my “home” disciplines, political science and peacebuilding. Therefore, they made me sit up and think. You would think this would be obvious, and it something peacebuilders do pay attention to. However, the best authors I’ve read on disruptive change stress how rapidly that environment changes. In other words, what works today probably won’t work tomorrow. Leaders have to plan keeping those changes squarely in mind, which is perhaps the biggest takeaway I learned from Heifetz and people who have followed in their footsteps. Experimenting with early prototypes is one of the key mantras in the writing on design thinking in Silicon Valley these days and is usually accompanied with tag lines like fail early, fail often, and learn from your mistakes. Peacebuilders and political leaders are rarely in a position to launch projects knowing that a lot of them will crash and burn. In fact, that’s also true of corporate leaders as well who are rarely willing to bet their investment on half bake ideas. Nonetheless, there is a lot to be said for testing ideas early, trying several approaches, and responding to the feedback you get. That is, after all, the key lesson one should take away from systems theory that underlies everything I’ve been working on for the last fifty years. Peacebuilders today stress the importance of local peacebuilding or bottom up approaches. There is little doubt that people on the ground do have the best insights into what will—and won’t—work in their environments. However, we should not downplay the role of creative leadership. If Gowing and Langdon learned anything in their hundreds of interviews with C-Suite executives in the public and private sector, it is that creative leaders are a necessary if not sufficient condition to dealing with our rapidly changing world. Leadership from the top down is never enough as you can read in any of the thousands of books on organizational development on the market today. Creative leaders not only have to come up with cool new ideas, they have to empower the people the lead because they are likely to be the initial source of those ideas and they definitely will be needed in carrying them out. Failure to pay enough attention to this final category may be the most worrisome in peacebuilding today. This term originally comes from the military strategist, J. C. Wylie. As early as the 1960s, he argued that you could never plan an entire military campaign from start to finish. I’d add that you can’t plan any kind of campaign from start to finish today. Instead, we need to think about how our accomplishments in one phase of a peacebuilding campaign could or should lead to the next. My reading of our work in the thirty years since modern peacebuilding and conflict resolution began is that we have done lots of terrific projects. However, we haven’t figured out how to build on them to create something akin to a scaffolding for larger scale social and political change.